The work of Got Your Back Network is made possible through the generosity of people who care. They care through a variety of ways including financial support, business services, product donations and promoting the work of Got Your Back Network. Got Your Back Network is a 501(c)(3) foundation. Our goal is to provide the children of our country’s fallen soldiers the opportunity to intimately interact with our country’s most talented leaders. Through diverse coordinated events along with one on one interactions with corporate executives, politicians, professional athletes, and entertainers, Got Your Back Network provides the avenue for the children of the fallen to learn and be inspired by the most successful leaders of our generation. Got Your Back Network was founded by U.S. Navy Lieutenant Commander Andy Baldwin who has been honored on the Washington D.C. Most Influential People under 40 list in 2009, and Outside Magazine’s Top 100 Influential People of the World list in 2006. His true passion, though, lies with the families of our fallen soldiers. Our Board Members and Advisors represent an impressive mix of individual talents and professional backgrounds which enable them to provide governance of the highest quality. We also understand the necessity of providing these children with the opportunity to fulfill their individual dreams. Got Your Back Network has relationships with Fortunate 500 companies,professional sports teams, Hollywood and Capitol Hill. 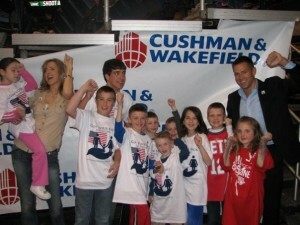 In the last year the foundation has created and has been involved in events with the New Jersey Nets, Disney World and the GI film festival. During the summer we will be collaborating on an event with OSU Tours at NASCAR’s Texas Motor Speedway. Capitalizing on the extensive networks created by the founder, and leadership of the foundation, within the entertainment and professional sports industries, Got Your Back Network will organize special events and mentorship activities. As our foundation grows, our vision is to meet the specific dreams of each child. To maintain our success, Got Your Back Network relies on corporate sponsorships, individual donations, grants from foundations, business services, product donations and members promoting the work of Got Your Back Network.